It's a Global Christmas at Falcon. At Falcon.io we make every effort to grow and develop our team. This means actively recruiting the best and brightest from around the world to bring a unique perspective to our office in Copenhagen. Not only does this diversity feed our business but it also provides a rich source of intra-office humor, especially between foreigners and traditional Danish customs. We asked three Falconeers—Joe, Anna and Riccardo—to share their thoughts on celebrating Christmas away from home, and how things are different here in Denmark. Check out their responses below. And don’t forget to catch these three during their panel at Copenhagen’s Social Media Week. They will be speaking about breaking into the tech industry as expats, and what it’s like behind the scenes at Falcon.io. 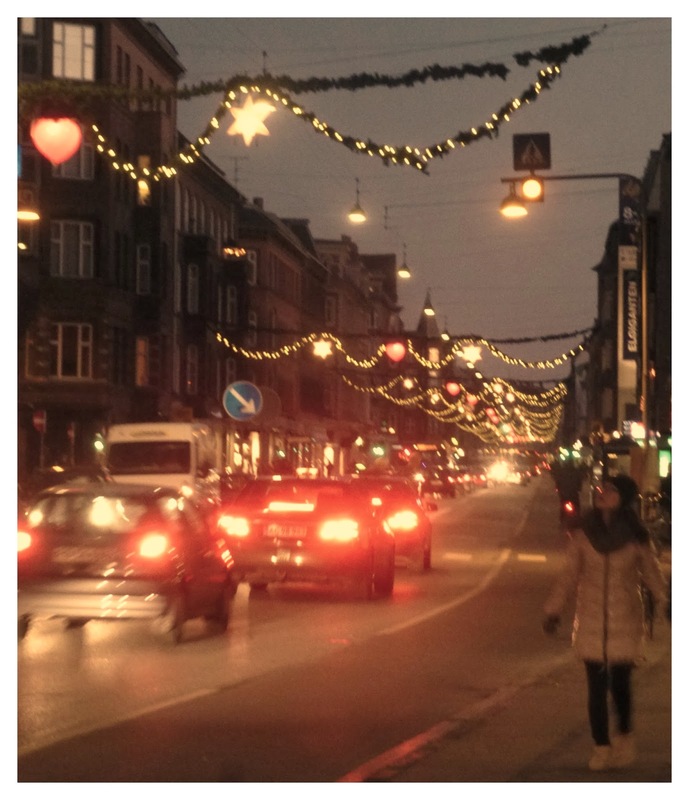 I’m pleasantly surprised to see how widespread and consistent Christmas decorations are around Copenhagen. Most apartment decorations are understated, with a single illuminated star, while many of the major throughways are brightly lit—like my neighborhood in Amager. It’s a subtle but welcomed change from elaborate nativity scenes and inflatable reindeer. Also, I’ll take gløgg over eggnog any day. My family isn’t huge on traditions. Our gatherings tend to follow a loose structure that has become even more relaxed over recent years. That being said, we still carry-out two core rituals: on Christmas eve, which is the 24th for us, we enjoy the feast of seven fishes and then later that night we go out, along with the rest of our neighborhood, to light luminarias, which outline the walkway leading up to my parents’ front door. I specifically remember being told as a child that Santa needed to see these lights to find our house from his sleigh. For my family neither of these acts carry any religious significance; they are simply catalysts for conversation, laughter and storytelling. Don’t get me wrong, office Christmas parties are a hit back home. But not like this. When Danes talk about Julefrokost they are almost always grinning, which makes me the kind of nervous excited that you can feel in the pit of your stomach. I’ve heard stories that start in Copenhagen and end up in Norway…on skis. We have close to 100 people on staff here at Falcon, and I can’t wait to see where we all end up. I already feel badly for anyone else on the dance floor that night. You learn quite quickly that Danes make stuff! Beyond LEGO and wind turbines, the Danes adopt the same make-and-do approach to Christmas – hand-crafting their own decorations, cards, biscuits… And don’t get me started on the ornate gift-wrapping. Let’s just say that whether it’s a carrot or a piece of coal, if it’s been gift-wrapped by a Dane, it’s going to feel truly special! They also do food, drink and cosiness pretty well – but that’s no different to any other time of year. I call the west of Ireland home – and happen to live footsteps away from our Parish church. That means for our family, the ceremony on Christmas eve night (24th) is a focal point. We congregate as a family and a community – and enjoy singing the classic carols along with the choir. Presents are exchanged that night so all hands are on deck for the dinner-making on the big day (25th); to feed an Irish family, you need full focus, and lots of helpers! Contrary to stereotypes, little drink is consumed as we need drivers to go visit relatives and neighbours. General storytelling and singing ensues. What happens on St. Stephen’s Day (26th) is hard to explain – but it involves singers and/or dancers arriving on your doorstep. A tradition known as The Wren Boys. Funnily, some stories of its origin have Scandinavian roots, linking back to Viking times. It’s my second Christmas here at this point – so now that I know what’s in store, I’m pretty excited to try it out again! I’m referring to Julefrokost, or the Danish Christmas Lunch. Armed with some insight this time around, my tactical approach needs to be sharper. Last year, I definitely peaked too soon and didn’t leave enough room to try out all the extensive treats on the menu. Also made some illegal combinations with rugbrød/herring/sauce – there was lots of flinching from the Danes who witnessed some rookie mistakes in assembling the open sandwich / smørrebrød. You could call it an art or a science – but either way, you get it right. And eat it with a knife and fork. This is the homeland of hygge (the quintessence of Danish culture). You can’t find a better country to celebrate christmas, at least if you ask a Dane. And for the most part they are right; there is something special in the atmosphere that brings back the child in you. I guess it’s somewhat related to traditions like “julekalendergaver,” an advent calendar with a small gift for every day in December. Although, every tradition has its backlashes. In my case it means that my kids (4 and 6) wake up at 6 every morning anxious to open their presents! I come from Sicily, where we have 300 days of sun a year. This probably has some effect on Christmas being a big event on the 24th, 25th and 26th. Our gatherings usually involve lots of food and my grandmother singing traditional Sicilian and French (nobody knows how the French came into the picture) songs. Celebrations always end up with a nice glass of spumante and a slice of pandoro (the traditional Italian christmas cake). I’ve been in Denmark for 10 years, my wife is half Danish and half English, so I’m a real veteran of the Danish Christmas ways. Every second year we go back to Italy to celebrate with my family. But not to worry, by the time I get to Italy I will have already had 2 big Christmas lunches: one “surrogate” Christmas with my Danish family (presents included) and a wonderful julefrokost with my colleagues at Falcon!